Its name will be "Red Dragon." And if the latest partnership between SpaceX and NASA works out, the privately funded craft will land on Mars to collect scientific data — possibly within the next two years. The plan is to use the Dragon capsule, but without a human crew. 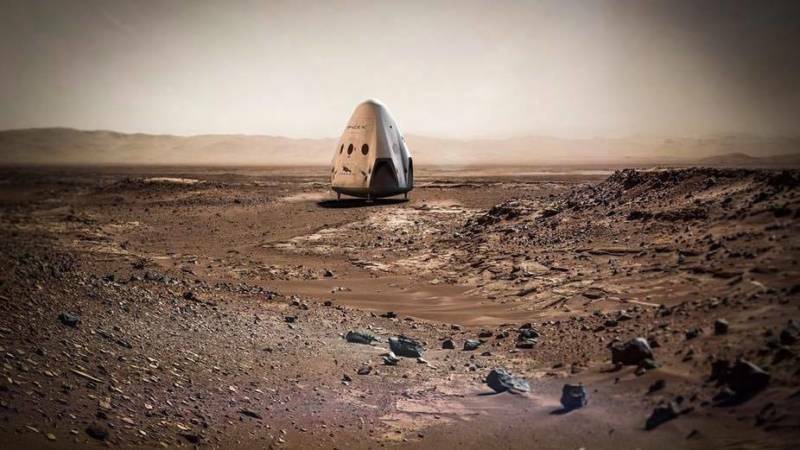 "SpaceX is planning to send Dragons to Mars as early as 2018," the company said via Facebook Wednesday. "These missions will help demonstrate the technologies needed to land large payloads propulsively on Mars." A propulsive landing, we'll remind you, is the use of powerful rockets to lower the spacecraft in a stable — and, if all goes well, reusable — position. "You can't land on Mars using parachutes like you would on Earth," NPR's Geoff Brumfiel tells us, "because the atmosphere isn't thick enough." The Dragon craft is meant to carry astronauts, but SpaceX founder Elon Musk says the SUV-sized interior of the craft would make it difficult for humans to endure any trips longer than from the Earth to the moon. Still, NASA Deputy Administrator Dava Newman says that her agency is closer "to sending American astronauts to Mars than anyone, anywhere, at any time has ever been." In a statement about the collaboration with SpaceX, Newman says a new and broad consensus is emerging that calls for sending astronauts to Mars in the 2030s. SpaceX's Musk adds via Twitter that the new Dragon 2 craft is "designed to be able to land anywhere in the solar system." Few details were announced along with the news of SpaceX and NASA's Mars collaboration; more details are likely to come out this fall. For now, a SpaceX representative says that while the company will fund the mission, NASA will give technical support — along with access to the Deep Space Network for communications. After announcing the plan, SpaceX tweeted a video clip of its Dragon 2 capsule using its "SuperDraco propulsive landing system" to seemingly hold itself in a stable position a few feet off the ground at its test facility in Texas. In addition to figuring out the logistics and tools that are necessary for interplanetary human travel, the Mars mission could answer enduring questions, Newman says: "Is it habitable and did life ever exist on Mars?" The plan to land a capsule on Mars comes more than 50 years after the U.S. sent the Mariner 4 scientific probe streaking past the planet, back in July of 1965.